Authors: M. Pierre, F. Pacaud, C. Adami et al. Authors: E. Koulouridis, B. Poggianti, B. Altieri et al. One of the most exciting aspects of astrophysics is the relationship between various chaotic phenomena occurring at vastly different scales. Take the example of galactic centres: black holes in these regions influence not only their immediate environment but the entire galaxy. Spatially, this is like a basketball kept in your backyard affecting your entire continent! Our quest to figure out what’s up in these anarchic environments leads us into the territory of multi-wavelength multi-probe astronomy and sky surveys. 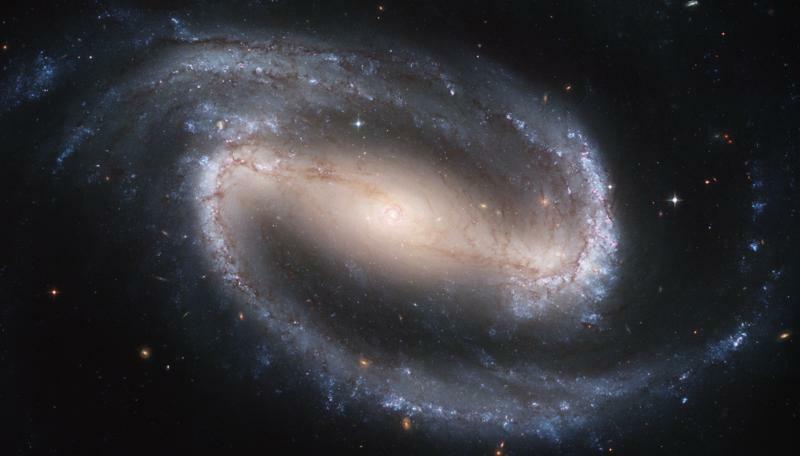 We use telescopes in the sky like Hubble or the upcoming James Web Space Telescope, or the very successful ground-based Sloan Digital Sky Survey (SDSS) and the ongoing Dark Energy Survey (DES), to fulfil the task of surveying the sky for objects of interest. The nucleus of a galaxy is called active when a supermassive black hole at the centre of a galaxy ‘switches on’, in the sense that we receive all sorts of radiation from it . This means that our observations need not just be in the optical band of light. These are exciting since supermassive black holes in AGN (Active galactic nuclei, or see these astrobites by Becky Smethurst and Andrew Emerick) and the accretion disks around them are some of the most chaotic and energetic environments in the cosmos, resulting in lots of high-energy emission. This property makes galaxies and galaxy clusters some of the coolest arenas of the universe! One of the biggest mysteries in galaxy science is the role that AGN play in the evolution of galaxy and clusters, and vice versa (Paddy Alton’s astrobite is a great report on this topic). The black hole and its environment have a strong gravitational influence over their surroundings, and there are competing theories over the way this may occur: the black hole may attract gas towards the centre of a galaxy cluster to increase rate of star formation, or it might expel gas through galactic and intergalactic winds to reduce the fuel available for star formation and X-ray jets in AGN of a cluster. In turn, an AGN might switch on because a large number of galaxies are surrounding it (blame gravity again!). This last theory can be studied by counting the number of AGN around the centre of a cluster, as compared with a non-clustered patch of sky. However, the problem is complicated by different light bands giving different observations. For example, when using optical data, the number of AGN within galaxy clusters remains ‘inconclusive’. On the other hand, radio-bright AGN appear to be more frequent in clusters. Empirically, X-ray seems to be the best regime to decipher this mystery. The XMM-Newton (X-ray Multi-Mirror Mission) was launched by the European Space Agency in 1999 as an X-ray observatory in a geocentric orbit around the Earth. XMM’s ultimate push has resulted in the their latest run – the XXL Survey, which, as of 2015, is the best there is in the X-ray business! Spanning 50 deg2 of the sky with an angular resolution of 6” , XXL looked for AGN and galaxy clusters in the low-energy X-ray regime. (See Fig 1). A set of thirteen papers have been submitted by the XMM consortium, with varied subjects (the complete list is given in Paper I: Appendix A). Fig 1. Example of an XXL image. The colour scale is the total number of photons collected per pixel. The small panels are multicolor optical band images from another survey called CFHTLS. The red overdensities are galaxies. Figure from today’s Paper I.
I choose Paper XII in the list as this article’s core theme primarily because it is a classic example of the juxtaposition of several concepts and paradigms, while also highlighting the collaborative nature of astrophysical sky surveys. 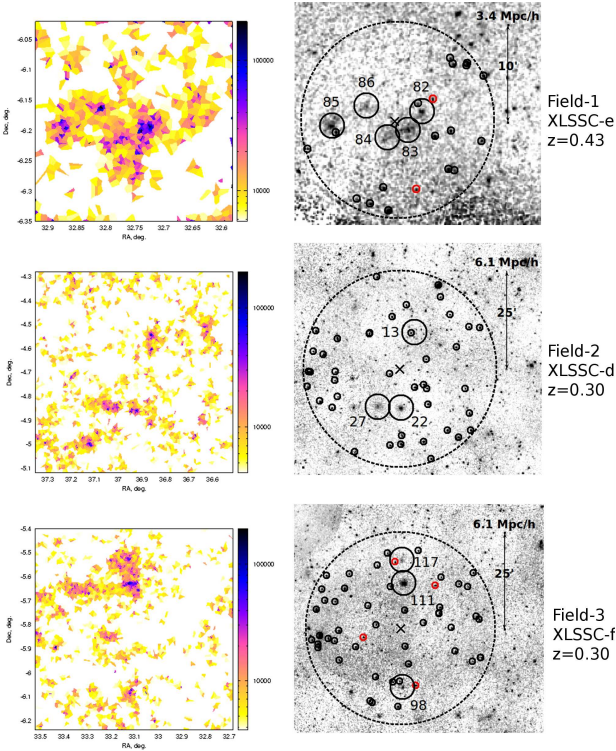 It is a report on the spectroscopic observations of three fields (called XLSSC-d,e and f) in the survey, chosen based on high density of clusters that emit light in the X-ray regime (i.e. luminosity above 1042 erg s-1). The authors used the 4.2m William Herschel Telescope to take spectra for the objects discovered by XXL. This study investigated the most massive formations in the universe – superclusters, which are made of several galaxy clusters, and are around 1 giga-light year across. Fig 2. Images of the three superclusters. Left panels are something called VT images from CFHTLS, while the right panel represents the corresponding X-ray maps with studied objects marked with circles. The red circles denote AGN whose spectroscopic redshifts are confirmed. Figure from today’s Paper II. Here, XXL discovered three superclusters in the three fields (see Fig 2) – one at redshift 0.43 and the other two at redshift 0.30. 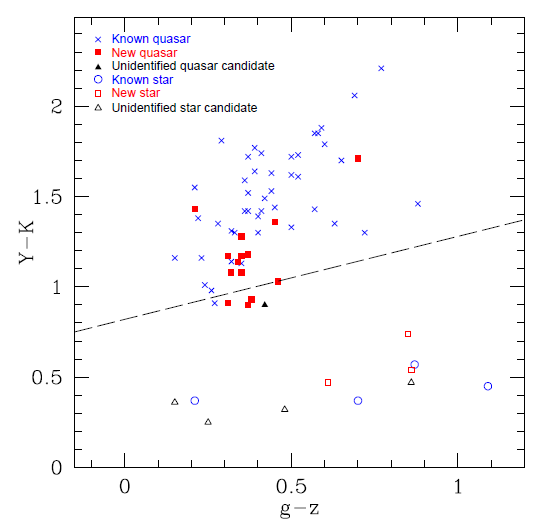 The supercluster in Field 1 (XLSSC-e) appears to be a merging supercluster, whereas the others (XLSSC- d and f) appear to lie in a relatively loose configuration and are quite similar spatially. In Fig 2, you can see the X-ray observations, and the location of the centres of the superclusters, assuming a spherical structure. X-ray sources in the these images seem to indicate the presence of AGN and it is the number of these objects that the authors are interested in. In total, six AGN with spectroscopic redshifts were found, with the study concluding that there seems to be an overdensity of AGN in these fields, relative to the other galaxies in the same field. This could indicate that the supercluster environment might be causing the switching on of the AGN. Although the authors advise the reader to take these conclusions with a pinch of salt because of the small number of superclusters studied, there are interesting implications on whether AGN activity is correlated with gravitational influences of the cluster and supercluster environment. More supercluster studies are underway. Stay tuned!